Citing anonymous sources within Apple, Bloomberg reported on Thursday that the new app will run on recent iPhone and iPad releases, and is being developed by the same division that cranked out Final Cut Pro and iMovie. 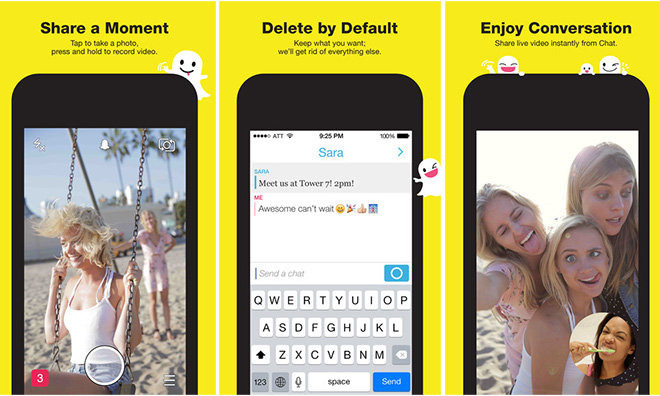 Currently, the app is said to allow users to record video, apply filters, and send it to contacts or upload for sharing existing networks like Facebook or Twitter —similar to Snapchat. The design goals are reportedly one-hand use, with the complete process including image capture, editing, and uploading taking less than one minute. Apple may have hired Joe Weil in December 2015 to helm the service. Weil co-developed the video blogging service KnowMe, and served as the President of advertising prototype company 321 Launch. Also reportedly underway are evaluations of more social media sharing features for iOS. The same report claims that an expansion of Apple's adaptive assistance functionality that makes suggestions to the user based on location and time of day may grow. However, any growth of user data sharing is examined by an Apple panel that examines privacy issues with any proposed Apple feature. The privacy panel, as well as development issues may either delay release, or push it back past a projected 2017 release date. Information surfaced in March that three "privacy czars" must sign off on any product collecting customer data. The group attempts to keep customer data stored on a device rather than on Apple servers, and isolated in categories. Debates between the three executives on the privacy panel are said to last at least a month, and reportedly have stretched out over a year. Any new social sharing feature implemented by Apple in 2017 would have to be examined by the trio first. Apple has tried social networking in the past. Apple's Ping was introduced in 2010 as a social way to promote music discovery. Apple CEO Tim Cook killed the product in 2012 with the introduction of iTunes 7.